Some of us are drawn to cemeteries. I can’t explain it. 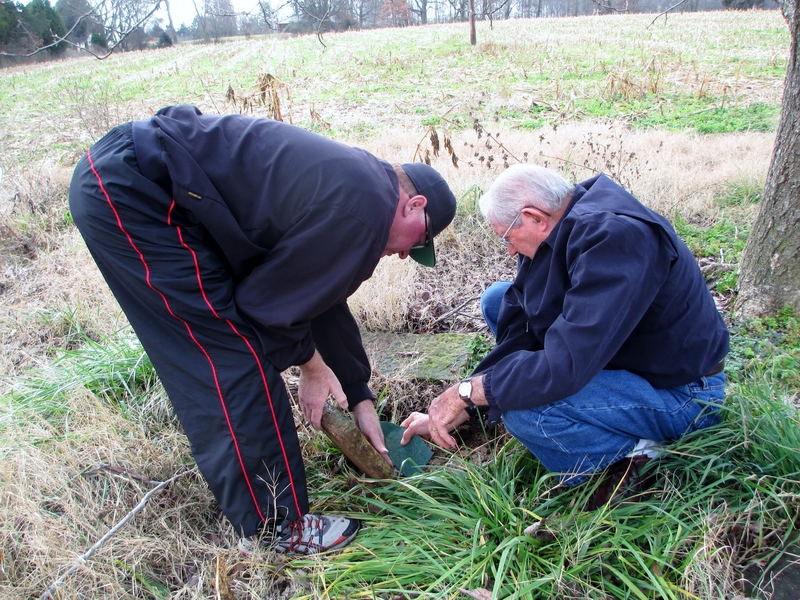 Finding the final resting place of our ancestors becomes a quest. It completes a picture for me. I want to know where they were born, walk the land they walked and visit the place they were buried. Strange. I can’t explain it. But somehow it connects me. I’ve “met”, corresponded and visited by phone with a number of Roberts cousins over the past few weeks. 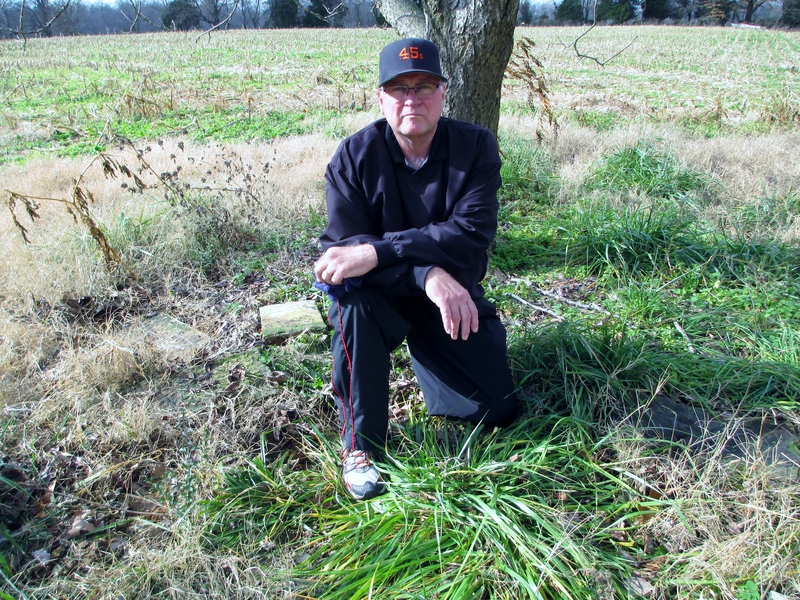 One of the newest ones is Charles Roberts of Calloway County, Kentucky. He is the 2 x great grandson of Newton T. Roberts, the brother of my 2 x great grandfather John Rivers Roberts. Charles asked me if I could “shed some light” on where my great great grandfather John Rivers Roberts and his wife Rebecca Ann Giles are buried. I believe I can (or at least I have an opinion). Here’s the story. I grew up knowing little or nothing about the Roberts family except the names of my grandparents Gus and Emma Lee Roberts. I peppered my dad Burton Lee Roberts with questions as a teenager. He either couldn’t or wouldn’t tell me what he knew. I believe he knew little or nothing. About 30 years ago in the middle of my own growing family and ministry work a couple of college professors, amateur genealogist, shared with me the name and burial place of my great grandfather John A. Roberts. I did nothing significant with this information until 2012. Perhaps it was age or opportunity but I’ve always been curious and had to know some answers. I’ve learned much about the Roberts family since “striking” the trail in 2012. By 2013 I thought we (my faithful wife and research assistant Dee Ann) had enough information to make a trip to Tennessee and Kentucky. We picked up the trail in Tennessee a few days after Thanksgiving and enjoyed the end of a weekend of celebrating the anniversary of the Battle of Franklin. The Carnton Plantation is well worth the visit. On Monday morning we were in the Williamson County Archives as soon as the considerate and helpful staff opened the doors. If you’re doing genealogy research for Williamson County ancestors, this is a must visit. It’s a library, research center and courthouse all rolled into one. We took pages and pages of document copies away from the center at very reasonable prices. They have a computer database from which you can search, access and print records. They have an excellent collection of genealogical volumes for research only purposes. They have books and collections for purchase. They have old maps. And did I mentioned they have informed and helpful staff and volunteers? I continue to mine the gold and assay the value of the nuggets we unearthed in our visit. The story of my Roberts family continues to unfold in bits and pieces. As we assemble the pieces of the puzzle, the picture becomes brighter and more certain. I’m very interested in any piece you may have to add to the puzzle. John Rivers Roberts was born October 14, 1800 in probably Lunenburg County, Virginia. (We hope to pick up the trail there someday soon.) Family lore says he was named after his father (John) and his mother’s maiden name “Rivers”. I can’t confirm this. In fact, I find evidence to the contrary. However, I never discount family lore until I can completely discredit it. Even if it’s not true, it often has an element of fact in it. There is a possibility that our family lore is off by one generation and that it was his grandfather who was married to a Rivers and not his father. We have yet to confirm the first name of John Rivers’ grandfather but believe we know where to pick up his trail. Here’s a quick side note for those researching this family. Pay close attention to allied families and neighbors in both Williamson, TN and Lunenburg, VA. You will see many of the same names and find where the Roberts children obtain their mates. Keep in mind that Lunenburg County changes configuration at least 3 times and maybe more during this Roberts family tenure there. Look at the Roberts and their neighbors on Juniper Creek off of the north branch of the Meherrin River in Lunenburg. This appears to be the beginning area of our specific Roberts family branch’s multiplication in America. My candidates for John Rivers’ grandfather include William, Thomas and James. My leading contender is James, the same name as John Rivers’ older brother who was born in 1798. Keep in mind as you research that there appears to be two James Roberts on Juniper, Senior and Junior. It’s possible that one of these is John Rivers father’s dad and the other his brother. It’s possible that one is his father and the other is his grandfather. It’s possible this is not the name of John Rivers’ grandfather at all! John R. (the name I usually use to identify John Rivers Roberts) married Sarah B. “Sally” Smithson in 1821. Family lore says she was an exceptionally beautiful young lady. She came from a large family with a large presence in Lunenburg, Charlotte and Mecklenburg counties of Virginia. They also had a big presence in Williamson County through the 1800s. They settled on Rutherford and Flat Creeks in the southern part of the county. 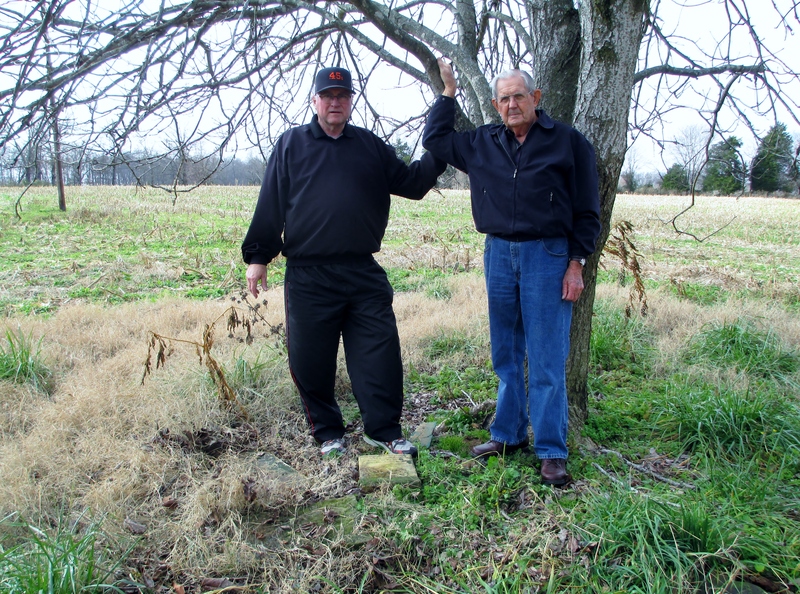 Brothers John R. and Newton would eventually buy land on these same creeks and begin their own families. John R. and Sally Smithson Roberts welcomed their first child Clement Smithson Roberts in 1822. He appears to be named after his maternal grandfather Clement S. Smithson. Their second child was a son as well, they named James in 1825. Was this in honor of my John Roberts Senior’s father? I don’t know but it could be a clue. Sadly, I have reason to believe the arrival of this son coincided with Sally’s death. John R. now had two young sons to raise on his own. Dee and I left Williamson County headed for Calloway in early December. We had pre-scheduled visits to the courthouse in Murray and the Pogue Special Collections Library on the campus of Murray State University. We had also arranged to meet with Rudy Roberts Holland and tour the Liberty/Shiloh area. Only our visit with Nancy Roberts Thurman did not go as planned because of an illness in her family. Rudy Holland is everything you would expect to find in a Kentucky gentleman. He was warm and gracious, informed and helpful. He shared family group sheets and a copy of his GEDCOM file he had on disc. He allowed me to copy (I photographed) his Roberts family binder. A few years ago Rudy had an old log cabin he was told John R. had built over 150 years ago moved up behind his farmhouse. Rudy built a cedar exterior around it to protect it from the elements. What a wonderful experience! What a wonderful Roberts’ family treasure! Then we were off to the cemeteries where we visited my great-grand-aunts and uncles’ final resting places. There were plenty of cousins as well. But what about John Rivers and Rebecca Ann Roberts place of rest? Where was John R. and Rebecca Roberts? 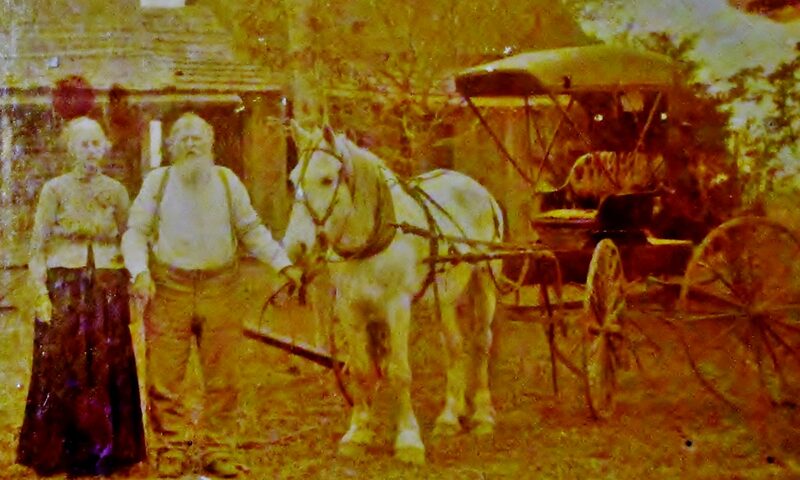 John R. and Rebecca bought a farm in the Shiloh community Calloway prior to 1860. They’re working the farm with a young John Childers whose family they knew in the area. The farms adjacent to theirs are owned by the Hollands, Roberts (W.C. and T.P.) and Ivies. By the 1880 census Rebecca is deceased and John R. has married his neighbor Malinda Holland. Her maiden name was Miller. 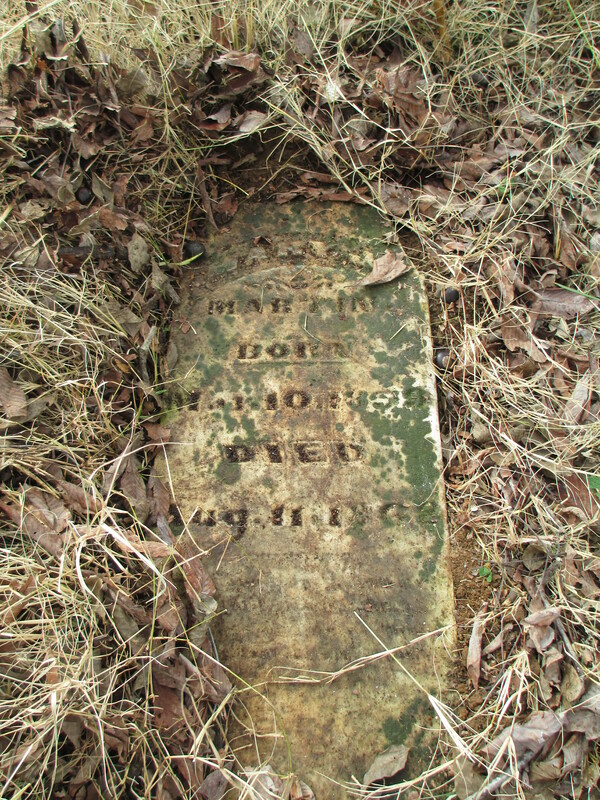 She married Josiah Holland in January of 1843 and he died in 1862. By 1880 she and their youngest son Henry B. Holland are living in the John R. Roberts household. Without an 1870 census for this same Roberts household I can’t be any more accurate on death dates (at least not yet). Rebecca died sometime after 1860 and John R. died sometime after 1880. I’m hoping someone has more information than this. Who knows, I may have it buried in a document I possess and have overlooked it. I asked Rudy if he knew where they were buried. I understood him to say that he had never seen the graves but his father or grandfather had pointed out a place to him. I asked him if we could go and take a look at this place. On old Hwy 94 just south of Crabtree Rd. there is a small modern home. It is believed to be the original home site of the John R. Roberts farm. Rudy believed the graves might be located under a single tree to the left of this home as you face it from the road. We made our way to the tree and saw nothing. It sits in a spot that has been tilled in the past but on a cold day in December we saw only matted grass, flat matted grass. Pulling back the grass we uncovered stones, several stones. They were lying flat and in soil under the matted grass. Some of the stones had writing. 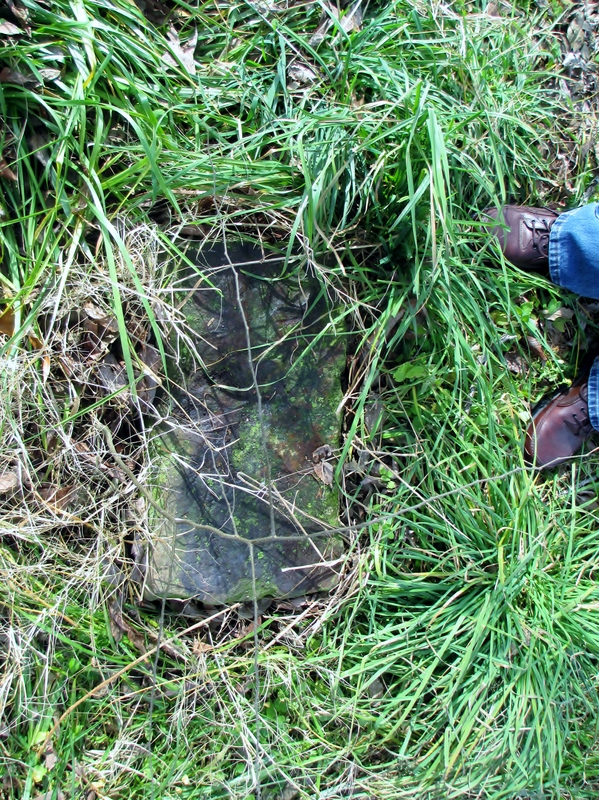 Some were large, flat field stones with scrapes from what appeared to be tractor implements. One recognizable name on an engraved monument stone was Mary J. Martin. The birth date appears to be 1839 and the death date appears to be 1862. The birth date may be 1849. Sarah Ann “Sally” Roberts, John R. and Rebecca’s daughter, was born in 1828 and married Ivason Brooks Martin in 1847 in Williamson County, TN. The dates don’t match her. If the birth date was supposed to be 1849 she could be their child. So, who is Sally J. Martin and why was she buried on the Roberts farm? There were other flat field stones here. Stones like you would use to mark graves. Stones like we saw in Arrington, TN. Kneeling beside these stones I felt connected. 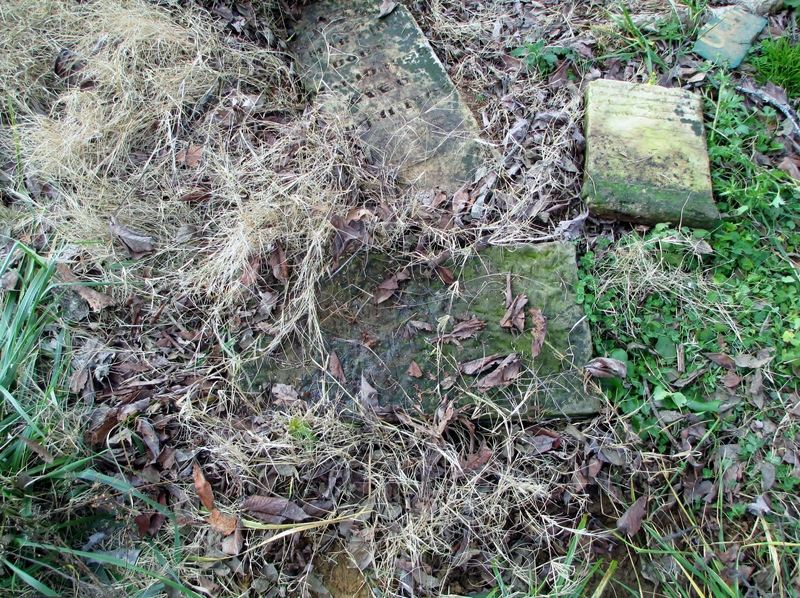 I believe this to be the final resting place of John Rivers and Rebecca Ann Roberts. For this reason alone, it will be a special place for me. This property sits approximately 300 yards south of the intersection of Crabtree Rd. (1551) and Kentucky Hwy 94 in Calloway County. Once you park in the drive way, look slightly to your left and there is a lone tree (2013) in the field that comes near the house place. The gravestones are underneath that tree. When I was there in December of 2013 they were covered over in matted grass. This should mean this is the site of John Rivers Roberts’ old home place. *Since publishing this post I have been able to document there are no missing years for this Newton Roberts family. *I now believe John R. and Rebacca Ann Roberts first child Sarah “Sally” was named after John R’s grandmother who lived in Williamson County until her death. Her name was Sarah Sammons but she went by Sally. Thanks Linda. I look forward to meeting you, Raymond and some of our relatives in North Texas together. We need to get Gary on the case! Beautiful article! Thanks so much for sharing it! Thanks Deborah and thanks for all of your contributions! Thanks for including me in this great continuing research effort. I had been meaning to ask you about John R Roberts 3rd wife Malinda Miller. Several years ago I was able to spend two days in Frankilin TN Library …. what a treasure trove. We can’t travel much anymore because of needing to care for my handicapped daughter, but I am still trying to work on it online. I love the detail in your work as well as very educated guesses when you don’t have conclusive proof yet. My “newly discovered” cousin Charles Roberts points out that Rudy Holland was also the 2 x great grandson of Newton Roberts, his 3 x great grandfather John Rivers Roberts’ son. I should have pointed out that Rudy’s connection to Newton Roberts is through his Holland side and his connection to John R. Roberts is through his Roberts side. There was a Sarah Roberts listed as HOH in the 1820, 1830 and 1840 Williamson County TN census. I was “fishing” for information on her when I ran across your “Backtracking”. I loved it so much I read it several times. You are a talented writer! I checked to see if we are a DNA match on Family Tree or Ancestry DNA–no luck! Keep writing and posting. Thank you so much for sharing! Sandra, Your kind words come at a good time for me. Thanks! Now, who was this Sarah Roberts in Williamson County for those years? Do you know her home district in the county? I’m trying to understand who all the Roberts were in the county during this time and may have some notes on this family. Do you have any other specifics? Hi Gary, It is difficult to explain years of research in a few words. Our 2nd great grandfather had a very common name–James Roberts. According to the 1850 &1860 Bates/Vernon MO census, he was born around 1817 in TN. We have tried in every way we know to locate him before he came to MO. We are almost positive that he was living near two sisters in 1850 & 1860 Vernon/Bates MO. I recently looked at every Roberts HOH in the 1820 Census for TN. I picked out all that had at least one male and two females under the age of 10. There were 20. Then I went forward to 1830 to find those that still had at least one male 15–19 and no longer had two of their females ages 15–19. (The two sisters were married by 1830.) There were 4 of the 20 Roberts that I could not locate (positively) in 1830. Only one of the remaining 16 fit the criteria and that was Sarah Roberts living in Franklin Williamson in 1820 and Williamson in 1830. I do not know anything about her and am trying to learn more to see if she might possibly be a missing piece to our difficult puzzle.